There were millions of paintings are drawn on a daily basis but there are only a few that will create impressions in our soul. The artists are so talented that they can show the feelings of the whole world in one picture. The only thing you have to do is to analyze and feel the impressions of the paintings. There are many paintings are drawn in the world that is critically acclaimed and became famous throughout the world. Paintings are being drawn since the ancient time and it is still unexplored how the people are drawings such paintings so perfectly though they don’t have appropriate tools at that time. Let me give you an example. I have written about mysterious of the world in that we have covered Nazca lines. Nazca lines are located in the Nazca desert of southern Peru. There were many figures that are drawn related to spiders, hummingbird, monkeys, fish, and orcas. The mystery is how people of Nazca culture can do such magnificent artwork. The simple reason is that they have nothing to view their ability from the air. So, here we are listing the top 10 most famous paintings in the world. It is believed that the portrait belongs to Lisa Gherardini. She is the wife of Francesco Del Giocondo. It is believed that the portrait has been painted between 1503 and 1506. It has been acquired by King Francis I of France and it now belongs to the French Republic. The painting has been placed in the Louvre Museum of Paris since 1797. Six million people annually came to the museum to see the beautiful painting. The expression of the painting seems mysterious. The expression is a composition and exists in many forms. This is one of the unique qualities of him the painting. The original name of Mona Lisa was Monna Lisa, however, spelling mistake made it the Mona Lisa and in Italian, it means Monna means Madonna that means ‘My lady’. There are three previous layers of the painting that depict her in different poses. The painting is literally priceless and hence it cannot be insured for any amount of money. It was painted in 1889 and the paintings depict the view from his room at the sanitarium where he lives at that time. There are many things that are added from his memory virtualization that leads to a village. The painting has been placed in the Museum of Modern Art in New York City since 1941. It has been acquired by Lillie P. Bliss Bequest. It is one of the 2,000 oil on canvas painting that has been drawn by one of the most popular artists of history. The Starry Night is among the most popular and famous paintings in the world. The painting states an inner, subjective expression of van Gogh’s response to nature. The painting is mainly depicting the Last Supper of Jesus along with his disciples. This has been told by the Gospel of John. Leonardo has depicted the situation when Jesus told his disciples that one of would betray him. There are 12 Disciples in the painting. There is very little painting that is left today. The facts responsible are environmental and intentional damage. Also, the method used in creating is one of the reasons. There are many methods used in restoring the picture and the last one being completed in 1999. Apart from one of the famous paintings in the world, it is also one of the most studied, scrutinized, and satirized paintings in the world. The painting is remembered for two primary reasons, Firstly, Christ says to his apostles “One of you will betray me,” and the apostles react, each according to his own personality. Referring to the Gospels, Leonardo depicts Philip asking “Lord, is it I?” Christ replies, “He that dippeth his hand with me in the dish, the same shall betray me” (Matthew 26) and secondly, Leonardo also simultaneously depicts Christ blessing the bread and saying to the apostles “Take, eat; this is my body” and blessing the wine and saying “Drink from it all of you; for this is my blood of the covenant, which is poured out for the forgiveness of sins” (Matthew 26). These words are the founding moment of the sacrament of the Eucharist that says the miraculous transformation of the bread and wine into the body and blood of Christ. The painting has been commissioned by the Spanish government as the suffering of the war but later it became the symbol of peace. Pablo Picasso uses the palette of multi colours namely grey, black, and white. It is considered to be one of the finest anti-war paintings in the history of the world. The paintings mainly depict the violence, chaos, and sufferings of the people. It is permanently displayed in Museo Reina Sofia Museum of Spain. The oil painting has been created on canvas measuring 11 feet tall by 25.6 feet wide and located in Spain’s national museum in Madrid. The tongues of the grieving woman, the bull, and the horse are in the shape of daggers that depicts screaming. The person with arms on the far right of the painting extended in sheer terror is trapped by fire from below and above. The painting basically depicts the Biblical creation narrative from the Book of Genesis. It displays how God gives life to Adam, the first man. The touching hands between God and Adam depict the symbol of Humanity. It is one of the most religious paintings of all time along with Leonardo da Vinci’s Last Supper. The painting is just one of the nine scenes from the Book of Genesis. The part of the image touching hands of God and Adam have become iconic of humanity. Also, read about mesmerizing prehistoric cave paintings. The painting looks very similar to the host from the Tales from the Crypt. It basically depicts the scream of nature. The painting shows the manifesting and suffering expression against a landscape. Orange sky can be seen in the background. The Scream was always on the target of the high-profile art thefts and eventually, one of the versions of the painting was stolen from the National Gallery. It has been recovered several months later. There are two paintings stolen from the Munch Museum named The Scream and Madonna and they both have been recovered two years later. Edvard Munch pronounced MOONK was born in Ekely, Norway on December 12, 1863. He was the son of a military doctor and was an Expressionist who loves to expresses strong feelings with the help of colours and bold brush. According to Edvard Munch, the inspiration for this painting was drawn from a past event. One of the most famous paintings is a result of the anxiety and fear he felt on a day while walking with two friends. “The flaming clouds hung like blood ” Edvard Munch. The basic idea of the painting is to make people think of their way of life and also the way they spend their time. It is also believed that the painting was inspired by Albert Einstein’s Theory of Relativity. It was first shown at Julien Levy Gallery in 1932. It is now a collection of the Museum of Modern Art located in New York City since 1934. There are many titles given to the painting like ‘The Soft Watches’ or ‘The Melting Watches’. The painting has been carved on an oil canvas painting measures only 24 cm x 33 cm (9 1/2” x 13″). This painting made Dali world famous when he was 28 years old. Pablo Picasso actually painted two similar paintings and they both mutually referred to as Three Musicians. One of the paintings placed at the Museum of Modern Art in New York City and the other one found in the Philadelphia Museum of Art. Pablo Picasso completed the painting in Fontainebleau near Paris. The musicians on the left side of the paintings is a masked Pierrot that is a classic figure often used in Italian comic theatre. The musician in the middle of the painting depicts the brightest garb that brings light to the centre of the piece. It is an oil painting which shows a girl with a headscarf and a pearl earring. It is on display in the Mauritshuis Gallery in The Hague, the Netherlands since 1902. It is all about Girl with a Pearl Earring. It is one of the most famous paintings around the globe. The girl in the painting is believed to be Vermeer’s eldest daughter, Maria. She about twelve or thirteen years old at the time it was created. One of the famous paintings in the world is regarded as Vermeer’s masterpiece and referred to as the Mona Lisa of the North or the Dutch Mona Lisa. The painting is also known as Girl In A Turban, Head Of Girl In A Turban, The Young Girl With Turban, and Head of a Young Girl. It is considered to be one of the most famous paintings in the world painted by the American outside the United States. It is displayed in Musee d’Orsay in Paris after it is owned by the French state in 1891. It is also called as Victorian Mona Lisa and considered as an American icon. Anna McNeill Whistler posed specially for the painting when she was living in the Cheyne Walk, Chelsea along with her son. The nickname of the painting is Whistler’s Mother because it is a painting of Anna McNeill Whistler, who was the painter’s mother. Since one of the world’s most famous paintings is of an artist’s mother, therefore, this painting has been used many times as a way to get people to remember their mothers and feel good about them. One of the famous paintings has been painted by the Spanish painter Diego Velázquez. It was hanging in the Museo del Prado in Madrid, the capital of Spain and painted in the year 1656. The word “Menina” in the painting means “lady-in-waiting” or “Maid of Honour”. TO conclude, it means the girl who serves in the royal court. According to the viewers, the painting is quite complicated because they generally do not agree who is looking at whom and why they are standing there. The painting shows a large room in the Madrid palace of King Philip IV of Spain where several people have been looking at each other and some are looking out from the paintings of the viewers. The person who stands in the middle is the Infanta Margarita. She is the princess and the daughter of the king and queen. The oil canvas painting measures approximately 73.5 by 112 centimetres and placed at the Royal Museums of Fine Arts of Belgium in Brussels. 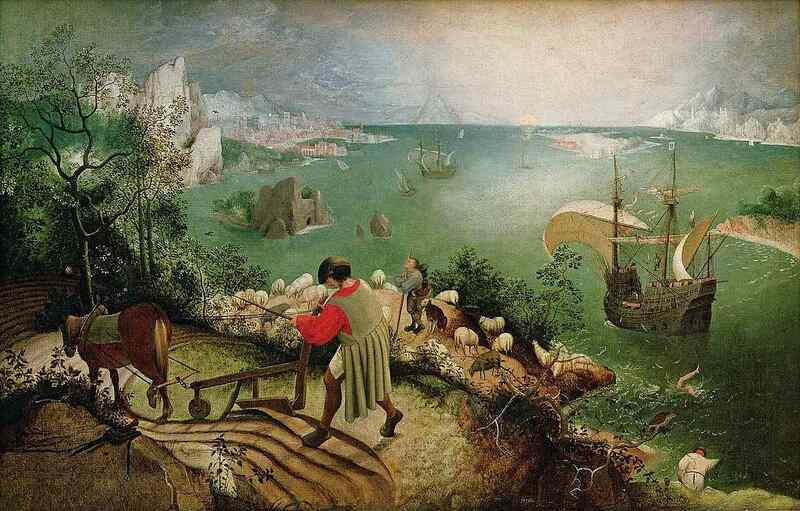 It was painted by leading Dutch painter of Dutch and Flemish Renaissance painting, Pieter Bruegel the Elder. According to the museum statement, e execution is by Bruegel the Elder, but the composition can be said with certainty to be his” because recent research has reopened the question. The painting was also described in the W. H. Auden’s famous poem “Musée des Beaux-Arts” and it was named after the museums that hold the paintings. The subject of the poem has the same name by William Carlos Williams, as well as “Lines on Bruegel’s ‘Icarus'” by Michael Hamburger. One of the most famous paintings is also known as the Decollation of Saint John the Baptist or the Beheading of the Forerunner. The paintings show an event and holy day observed by various Christian churches that follow liturgical traditions. The painting also describes the orders of Herod Antipas through the vengeful request of his step-daughter Salome and her mother Herodias. It was painted by the Dutch painter Rembrandt van Rijn and later it was completed in 1642. It was considered as the peak of the Dutch Golden Age and listed as one of the most famous paintings in the world. The oil canvas painting describes the company of Captain Frans Banning Cocq and his lieutenant, Willem van Ruytenburgh who was surrounded by sixteen other men. The painting is famous for its amazing light and shadow and the motion that depicts that would depict a traditionally been a static military portrait. The painting was hung in the Kloveniersdoelen in Amsterdam till 1715 and later it was moved to the town hall. However, in 1808 it was transferred to the Rijksmuseum in Amsterdam where you can still see it. It was called by two other names known as “Militia Company of District II under the Command of Captain Frans Banninck Cocq” and “The Shooting Company of Frans Banning Cocq and Willem van Ruytenburch“. The title of the painting known as ‘Night Watch’ was not given by the artist and later applied in the 18th century. The famous painting was a work by the artist Raphael and it was painted during the Italian Renaissance between 1510 and 1511. It was considered as one of the masterpieces of Raphael’s works and perfect classical spirit of the High Renaissance”. The purpose of the painting is to decorate the frescoes the rooms are now known as the Stanze di Raffaello situated in the Apostolic Palace in the Vatican. There are many people in the picture, however, some of the philosophers in the picture, such as Plato or Aristotle are easily visible. These are the famous paintings in the world. Do post your comments.